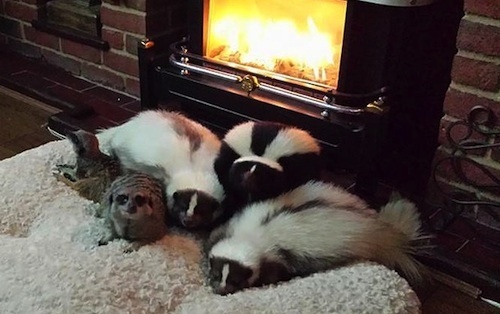 Why did skunks evolve with such di-STINK-tion? Meet biologists Tim Caro and Theodore Stankowich. Yes, really. They study how some carnivorous mammals protect themselves from getting eaten. For example: meerkats huddle in groups, while skunks squirt noxious sprays. Why did each evolve that defense? To find out, Caro and Stankowich collected data on 181 carnivores. Little ones that get eaten by bigger predators. They filtered for certain data: Each species’ primary predator. Spray behavior. Burrow use. Social huddling. They also compared routines: Daytime creature versus nighttime creature. Result? Small daytime mammals mostly use social strategies for defense. They cluster! Their main predators are birds. More eyes looking up? Fewer meerkats become hawk lunch. And ground defense? Groups collectively bite, scratch, and taunt a predator until it leaves. Meanwhile, nocturnal animals, in darkness, can bump into predators. So spraying is handy! And, regarding Meerkats, of course -The Geography of Cuteness!